A little bit of clean up for Alexie’s film WILLOW CREEK where she played the part of Kelly, a woman who along with her Bigfoot enthusiast boyfriend Jim (Bryce Johnson) go on a trip to Six Rivers National Forest in California where the infamous footage Bigfoot was filmed by Roger Patterson and Robert Gimlin of the “mythical” Sasquatch. The film was directed by comedian Bobcat Goldthwait. An interesting article from PopOptiq on Alexie’s series NEW AMSTERDAM where she played the part of Dr. Sara Dillane opposite the current Kingslayer on Game of Thrones Nikolaj Coster-Waldau. The article outlines the show’s theme as well as an encapsulation of the series featuring a sort of “Where Are They Now” for the main cast. John Amsterdam has been around for a long time…a very long time. He’s an immortal man who was blessed with the gift after saving a Native American woman during his tenure as a Dutch soldier in the year 1624. The prophecy of the spell foretold that he would be immortal until the day he meets his one true love, who will make him whole again and ready for mortality. In modern day, Amsterdam passes the time as an NYPD detective, using his centuries of knowledge to solve cases. The series begins as he meets a new partner, Eva Marquez. Unlike many of his former partners, she is up to the task of working with a talented yet hard to handle rogue cop. While in pursuit of a perp, Amsterdam is shot down and wounded to the point of death, but once he is awakened again, he senses that he has been in the presence of his one true love, and so seeks her out. The show is part procedural, part character study, and part history lesson on the ever changing city of New York. FOX Network had picked up New Amsterdam for a 13 episode season with a Fall 2007 premiere that would’ve paired it with successful hospital procedural House, MD. However, the producers at the network changed their minds due to creative differences with the show’s creative team of Allan Loeb and Christian Taylor, as well as the all-encompassing battle with writers in general during the Writers Strike of 2007-2008. The problems in production caused FOX to delay the premiere during the mid-season, and halt production after eight episodes had completed. The series premiered in March to mixed reviews that did not bode well. FOX cancelled the show after the ratings dropped to less than half of its pilot episode. New Amsterdam had a very interesting premise, one that had a lot of promise that it barely scratched the surface of in its initial run. It had a strong lead in Nikolaj Coster-Waldau, and he’s very capable of performing the task of an immortal that has changed along with the times, as presented in flashbacks. It’s a premise that is fitting for an actor who wants to show range and variety. This series was created sometime after Lost, and it picked up some of the episodic structure of that series, presented in a very unique and focused way. The use of flashbacks revealed mythology of the character of John Amsterdam, which was compelling, and it was paralleled against the modern day narrative, which varied from procedural to serialized plot. The show was structured very intricately, and demanded the audience’s attention in a way similar to Lost, but perhaps the returns were not as rewarding for some viewers. Had the series continued, surely the balance would’ve been better made, as what the series was doing with its narrative was fairly new. At the center of this series is that fantastical element that John Amsterdam is immortal, which is not necessarily a new concept, yet it is one that has not been as exploited as one might thinks. Immortality is often made in connection with Vampires, but in New Amsterdam’s case, it is a gift given to him by a Native American woman as a reward for saving her life. It’s romanticized with the idea of the ‘One True Love’, as he needs to find her in order to become mortal again. Although this idea isn’t bad, it still relies heavily on the chemistry between John Amsterdam and his one true love. One of the negative marks against the show is the failed chemistry between Coster-Waldau and Alexie Gilmore, as it brings the audience to think ‘Her?’, which is not the best thing for the central relationship. The counter to this is his partner in procedural solving, with whom John has better chemistry, without the sexual tension. John Amsterdam is partnered with Eva Marquez (Zuleikha Robinson) who, despite not getting a whole lot of screen time due to far too few episodes, makes a strong impression with the lead. The series is mainly episodic, with serialized elements that were barely hinted at due to the short run, but it is clear that the creators had an understanding of the history of the character. Each episode functioned three-fold; the modern day narrative of the possibility that he has found his true love in Dr. Sara Dillane (Alexie Gilmore), the flashbacks, which function mostly to give depth to the character, and lastly the procedural case of the week, which tied into both the modern day story and the flashback. Where the season leaves off isn’t on a cliffhanger or anything, yet it is still not satisfying, as this show was still finding out how to best tell these stories, so where things are left off feels like the beginning of more interesting stuff that is yet to come. The reason why this series failed isn’t because of poor quality or lack of creativity; in fact, it had plenty of interesting aspects that could’ve made this series truly remarkable. The problem lies in the lack of faith from the network, as this show really needed much more time to develop and find its audience. This show is one that should be paid attention to and learned from, as the concepts on how to structure an episode and a season is very unique. Christian Taylor would continue to write for television, working on series such as MTV’s Teen Wolf and Star Wars: the Clone Wars. He also developed the recently premiered MTV series Eye Candy. Nicholaj Coster-Waldau has continued his career in films and starred in a failed pilot called Virtuality before finding acclaim for his current role in HBO’s highly popular Game of Thrones. Alexie Gilmore has appeared as a guest star on a variety of TV series, from House, MD to CSI to Nurse Jackie. 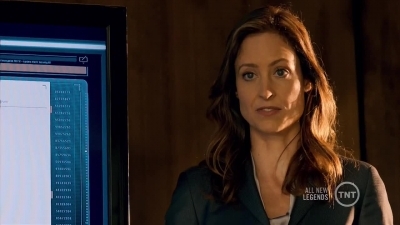 Most recently, she had a recurring role on TNT drama series Legends. Zuleikah Robinson went on to recur on Lost, and had roles in Homeland, Once Upon a Time in Wonderland, and most recently on ABC’s Intelligence. Unfortunately this series is currently unavailable on any streaming service or any home video media. Alexie has completed a new film. It is called FOR ALL EYES ALWAYS and it is in post-production. The film also stars Sean Astin and Lynn Whitfield. I have one still and an article for you. Read on. It was back in 2011 that we first came across the work of director Rob Bralver. The occasion at the time was his Cure For Pain: The Mark Sandman Story, an intimate look at the life of the former Morphine frontman that I like rather a lot and ended up programming as part of the Canadian Music Week film program in that year where it played to a very appreciative audience. Bralver has a pair of equally well received docs under his belt since then and is now launching production on his debut narrative feature, For All Eyes Always. Indie spy satire ‘For All Eyes Always’ has added Sean Astin (Lord of the Rings, The Strain) and Lynn Whitfield (HBO’s The Josephine Baker Story) to an ensemble cast. Film is the narrative directorial debut of doc filmmaker Rob Gordon Bralver (Our Vinyl Weighs A Ton, Cure for Pain: The Mark Sandman Story, editor of Gore Vidal: The United States of Amnesia). ‘For All Eyes Always’ imagines the CIA’s efforts to win back the confidence of the American public by creating a reality TV show that purports to show with total transparency the covert operations that occur around the globe on behalf of the United States. Ensemble cast also includes Joe Hursley (Fast & Furious), vine star Greg Davis Jr., Ganna Bogdan, Saïd Taghmaoui (American Hustle), Alexie Gilmore (Labor Day), Chasty Ballesteros (The Newsroom), Joseph Gatt (Game of Thrones), and producer Adi Shankar (Lone Survivor) playing a fictional version of himself. Written and directed by Bralver, the film is produced by Amy Child via their shingle The Koaffalo Motion Picture Company. Film is currently in production in Los Angeles. Good news! I’ve finally gotten Alexie’s work as Kelly in the Bobcat Goldthwait found footage film WILLOW CREEK up in the gallery. There are three things including the main film caps, plus the extras…that aren’t much. The DVD/Bluray were a standard release with minimal extras. The upside is the screencaps for the main film are in 720p therefore a resolution of 1280X720 as are the HD trailer caps. The downside is the extras are in standard form with a resolution of 640×360. I couldn’t get any better quality than that without the pixels being blown or the quality being too blurry. Sorry about that. I don’t know about anyone else, but I loved this movie with a capital “L”. I’m not all that fond of the found footage genre, however, this film is an exception. I love the premise as well as loving both Alexie (who wouldn’t) and Bryce Johnson as Jim. Bobcat Goldthwait knew what to do with this film. What was so good about it was the lore it was based upon. The infamous Patterson/Gimlin footage from 1972 was shown all over the world as proof of Sasquatch’s existence, however, there was plenty of scorn going around about the validity of the footage. I remember seeing this first on an episode of the Leonard Nimoy series In Search Of back in the mid seventies. I thought all the quirky characters including many in the area playing themselves added a bit of realism to the film. The draw though has to be the seventeen minute single camera shot toward the end of the film with Kelly and Jim waiting out the night as they are visited by what appears to be a Bigfoot. The rest of the film is just plainly delicious and the ending is unexpected so that when it does happen, it sort of shocks one. Though it does give a whole new meaning to the term “Forest Bride.” All I can say is poor Kelly. Alexie is just amazing in this and the audio commentary on the disc is so hilarious as Alexie is joined by Bobcat and Bryce, who is a Bigfoot aficionado. Having watched Robin since the 70s on the ABC show Mork & Mindy (I could tell you a funny story about babysitting and Mork), I remember religiously sitting down each week to see what this amazing comedian would come up with. I knew there was something manic about him, but enormously endearing. Mork just wasn’t a character in a television comedy, he was Williams. An alien in a land that didn’t understand his brand of humour…but I did. I then watched as this man bent himself into whatever film he starred in to become a genie, a penquin, a psychiatrist, a stalker, you name it. Robin Williams was a great man and will be sorely missed. Not only was he a great man, but he was also an amazing humanitarian. After the accident that paralyzed actor Christopher Reeve, Williams paid all the mounting doctor’s bills Reeve and his late wife Dana accumulated trying to help Reeve overcome his disability. He also helped through Comic Relief to help raise money for the homeless. 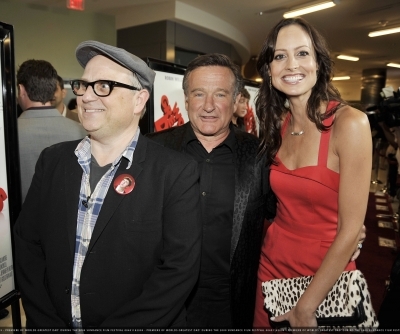 Robin also gave support to America’s troops, AIDS awareness…. The tributes coming out from across the spectrum of America’s strata aren’t just lame or empty platitudes, they’re heartfelt and heartbreaking for a man who made hearts grow and be a little kinder in light of his energy and dedication to what he did and those he made laugh. I’ll miss you Robin and whatever else you might have done in your next 63 years. As Lovelace once said, “You did everything penquinly possible….” Could we even hope to do as much as you did or give as much as you did over your short time on this earth? I don’t think so. Some hearts just aren’t that huge. I have a really good interview with WILLOW CREEK director Bobcat Goldwait. Nothing really about Alexie except for the mention she’s in the film. Enjoy. BIGFOOT ARE GIANT APE-MEN who live at the fringes of our so-called civilization, and when one eats you, no one will believe it. So learn Kelly (Alexie Gilmore) and Jim (Bryce Johnson) in Willow Creek when they visit the notorious “Patterson-Gimlin site,” where, in 1967, two men claimed to have filmed Bigfoot. Willow Creek is a mostly improvised found-footage horror movie that was shot on location—combined with the talents of Gilmore and Johnson and director Bobcat Goldthwait, that sparseness lends the film a surprising level of intensity. Goldthwait’s mostly known for comedies, but his past directorial work (like World’s Greatest Dad and God Bless America, along with episodes of Chappelle’s Show and Maron) boasts a keen eye for discomfort. He uses it to excellent effect in Willow Creek. MERCURY: How did the project get started? BOBCAT GOLDTHWAIT: Well, I knew I wanted to do a Bigfoot movie, and then when I actually went to Willow Creek, I changed my ideas. Originally I was going to do a comedy, but then it just seemed to lend itself to doing a suspense movie. I didn’t want to do a movie that was making fun of people who believed in Bigfoot. I consider myself a weirdo and an outcast, so I’m not about to pick on other people who are perceived that way. The goal was to try to make these people believable and characters you empathize with before terrible things happen to them. I think a lot of [horror directors] almost seem to resent the characters, and I wanted you to care about them. How remote were the locations? Were you out in the middle of nowhere? Oh my god, we actually went to the Patterson-Gimlin site, so we were. The town [Willow Creek] is 11 hours from LA, and then when you get to Bluff Creek, it’s about a two-and-a-half-hour drive down a 17-mile dirt road. So there’s nothing around. We saw mountain lions when we were filming. There was no craft service or hotel or anything like that. I thought, “Why are we filming this out in the middle of the woods? We should just do this in a hotel parking lot.” But I knew that in order to get the audio right that we’d have to do it out [there]. A lot of the sounds you hear in the movie were recorded live. Subconsciously, you’re not even aware of it, but the absence of planes or faintly heard traffic really added to the suspense. Coming from a comedy background, what did you learn shooting a horror film? That making people laugh and scaring them are really similar. There’s the misdirect, you know? You laugh at something because it’s not happening the way you’d perceive it would happen. Your mind tries to jump ahead. Turns out scaring people is the same thing. You set ’em up and then you make a twist. A really good review on Alexie’s film WILLOW CREEK. Read on. They say there are no second acts in American life – then there’s Bobcat Goldthwait. A stand-up comic most famous for playing helium-voiced punk Zed in Police Academy 2 (1985), Goldthwait has since been busy making sly, often filthy, indie films such as World’s Greatest Dad (2009) and God Bless America (2011). And for his next trick? A found-footage horror about Bigfoot, of course. Willow Creek is also a film of two acts, the first sunny and (seemingly) loose, the second precision-tooled for maximum creepiness. Holidaying couple Jim (Bryce Johnson) and Kelly (Alexie Gilmore) are on a sasquatch hunt around Bluff Creek, California (where the famous 1967 Bigfoot footage was shot), capturing their findings on camera. To begin with their trip follows the format established by The Blair Witch Project (1999). Encountering eccentric locals (often non-actors) aplenty, they – and we – mock their small-town superstitions, while ignoring repeated warnings not to venture into the woods. ‘It’s not a joke,’ says an angry local. ‘You shouldn’t go there.’ But go they do and, well, you know the rest. Except you don’t. Unlike most found-footage characters, Kelly and Jim are a charming, convincing couple. They’ve also brought a tripod, so their film is surprisingly easy on the eye. Goldthwait has some tricks up his sleeve, too, not least an astonishing 19-minute static shot of the couple in their tent, becoming increasingly terrified, as something stomps around outside. It’s at this point you realise that nothing here is accidental. Though it feels improvised, this is a well-honed work, with details laughed off in the daylight becoming spookily significant once darkness falls. 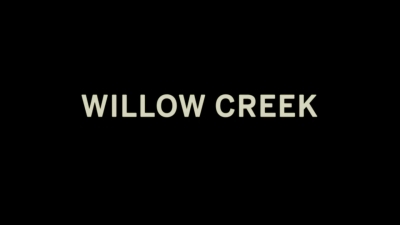 Funny, scary and over in less than 80 minutes, Willow Creek is so much better than it needs to be; it might be the start of a second act for the genre itself. Limited release from Fri 2 May.